Good furniture. Good for you, good for the planet. When shopping for timber furniture, you probably cringe at some of the high prices on it today. If you research far enough, though, you will soon learn that there is a way to save on furniture and save the environment at the same time simply by locating a company that uses recycled timber in their furniture pieces. Our company, Wenborn Wood, is one such company. Our following facts discuss the benefits of buying furniture that contains recycled wood. Since we utilise recycled Australian timber from such sources as construction timber, flooring, old furniture, crates, and industrial and commercial sources, we reduce the cost of our raw materials. As a result, we can pass these savings on to our customers to provide them with cost-effective furniture pieces for their home. You make an environmentally friendly choice when you decide upon furniture that contains recycled wood. Not only do you prevent used timber furnishings and elements from winding up in a landfill, but you also help preserve the old-growth forests throughout Australia. On top of the other benefits of turning to furniture with recycled timber, you will also discover that unique creations are possible with this type of wood. At times, we combine a mixture of different timbers to make our furniture and this provides you with a one-of-a-kind grain pattern throughout the pieces. You will not see the same piece in your friend’s house since each piece that we sell comes out just a bit differently than the same design that we make for another customer. Along with using recycled timber in our furniture, Wenborn Wood also includes sustainably harvested hardwoods from this country, such as Tasmanian oak, messamate or Alpine ash. Our fastening methods are traditional ones and involve no nails, screws or staples except in handles on tables or hinges onf items. Our workmanship and products are always top-notch quality to last you throughout the years in a durable, attractive manner. Handmade, Sustainable and Recycled Australian Timber Cabinets and Tables: What Makes Them a Popular Choice? What Is FSC Sustainable Timber and Why Should This Be Used in Furniture Making? 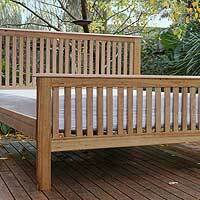 Custom Furniture Making: What are the Benefits of Using Recycled Australian Hardwood?